It’s all happening at Celebration in Brisbane, with THREE NEW PRODUCTS just announced live on stage. We’re so excited to welcome IsaLean™ Shake Chocolate Mint to the permanent IsaLean Shake range, brand-new Harvest Thins™ in Thai Sweet Chilli flavour and e+ Lemon Lime! Not at the event? Then set a reminder in your calendars! The newest additions to the ANZ product range are currently available only to buy at Celebration but will be available for purchase in your Back Office on Tuesday 3 April. #ChocMint took ANZ by storm when it was first released as a limited, seasonal flavour back in May 2016. Since then, requests have poured in to make the fan favourite a permanent flavour and, since we love it just as much as you do, we couldn’t resist. 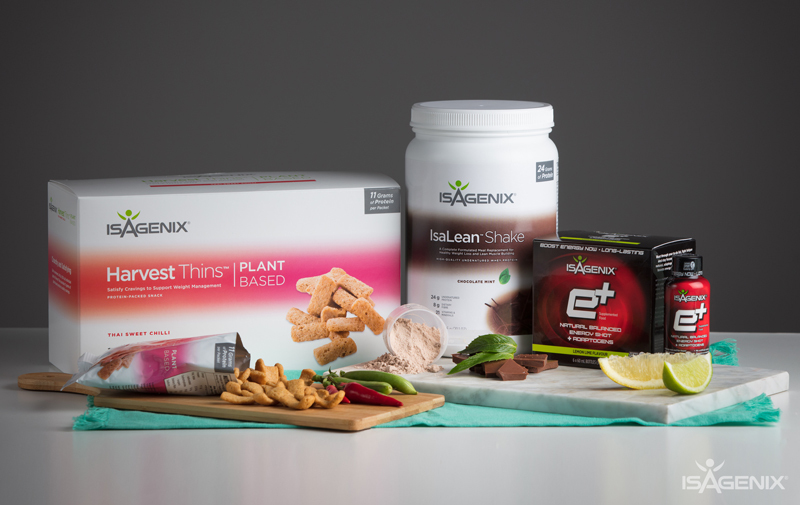 With the same nutritional value as all our other awesome IsaLean Shakes, this healthy and delicious meal replacement couldn’t be any more perfect! Spice up your Cleanse Days with the brand-spankin’ new Harvest Thins. Savoury and crunchy with a touch of sweetness and a healthy dash of chill, your taste buds are in for a serious treat. Even better, they’re completely plant-based and dairy free! So, if dairy isn’t your friend or if you just love mixing it up, grab a box (or two) of these Cleanse-Day approved bad boys from your Back Office on 3 April. With a whopping 11 grams of protein and only 100 calories per serve, Harvest Thins will help you kick the chip habit for good. A firm favourite of product users and our newest Product in the Spotlight, we knew it was only going to be a matter of time until the masses demanded more options of this delicious, top-selling shot of energy. Not only does e+ help boost energy, fight fatigue and fuel athletic performance, it’s also Informed-Sport Certified and can now be enjoyed in the newest flavour – Lemon Lime. This new flavour still offers the same scientifically supported blend of adaptogens and plant-based caffeine made from green tea and yerba mate to help you feel more energised and mentally alert.